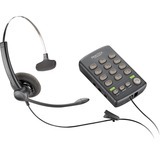 Blending superior comfort and reliable audio performance, the cost-effective Practica T110 Headset Telephone by Plantronics is ideal for workers in growing contact centers. The T110 pairs a generously cushioned, noise-canceling headset with an ergonomically designed, firm-key dial pad that reduces the stress of repeated manual dialing. A dial pad supervisor port gives users direct access to a manager, promoting rapid training and problem resolution. The T110 features flash, mute, and redial buttons as well as three flash settings-98, 300, and 600ms-to meet specific call center requirements. Adjustable volume and tone/pulse controls provide added user convenience and comfort.